Many industrial materials are granular in nature. With this research the researchers have shown that the presence of air between the grains can play a crucial role in the dynamics of the entire material. Sand is a granular material made up of individual grains. Sand grains can be piled up in different ways as a result of which either loose or compact sand can occur. The resistance that an object experiences in a layer of sand mainly depends on this packing density. If the sand grains are small enough then air between the grains can play a major role in this process as well. 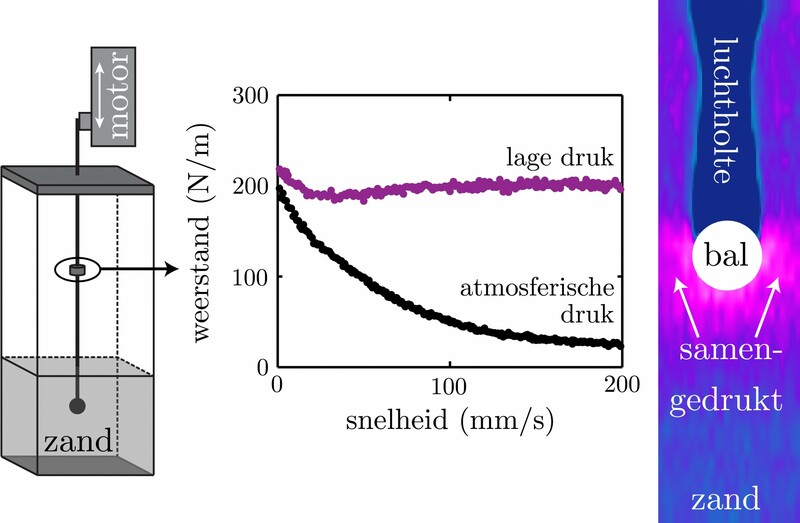 The researchers experimentally tested the influence of air between the grains by pushing a ball into a sand bed with the help of a linear motor. The rod connecting the ball to the motor contained a force sensor with which the resistance could be measured directly. Surprisingly it cost more force to move the ball through the bed slowly than to push the same ball into the bed with a higher speed. The researchers explain this as follows: when they push the ball into the sand bed, the sand around the ball is pressed together. The air in this region is trapped in the compressed sand and so if the ball moves quickly enough a higher local air pressure occurs. This build up in pressure prevents further compression of the sand and this ensures that the ball experiences relatively little resistance while moving. If the ball moves very slowly then the air has time to flow out of this compressed area and no build up in pressure occurs. In this situation the sand is more compact and so it costs relatively more force to push the ball into the sand. In the experiment, the researchers achieved a reduction in the resistance of up to ninety percent. Physicists repeated the experiments at low pressure. In that case the resistance was found to be independent of the ball's speed. Furthermore, the resistance was equal to the value that they measured at atmospheric pressure if the ball moved very slowly. This confirms that the air between the grains reduces the resistance. A ball is pushed into a container of sand with the help of a linear motor (left). At atmospheric pressure, the force needed to bring the ball to a certain depth is independent of the ball's speed (middle). Surprisingly, the slower the ball moves the more force is needed to push it through the sand. This speed dependence is absent if the experiment is performed at low pressure. The force needed is then constantly high. An explanation for this effect can be found by looking at the air in a compressed region under the moving ball (right).